Shakhriyar Mamedyarov and Veselin Topalov won their respective games against Peter Svidler and Vladimir Kramnik in round 6 of Candidates Tournament. 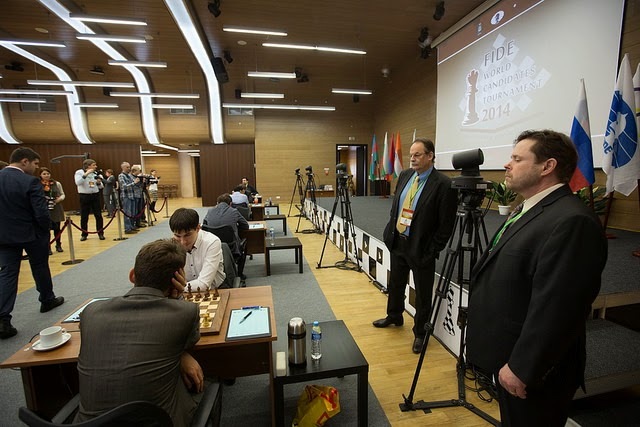 The other two matches, Viswanathan Anand – Sergey Karjakin and Levon Aronian – Dmitry Andreikin, were drawn. Anand must feel happier as Aronian missed to win and catch him on the shared first place. After six rounds of play Anand stays on the top with 4 points, while Aronian is close behind on 3,5. Four players are on 3 points each: Kramnik, Svidler, Mamedyarov and Topalov. Karjakin is on 2,5 points and Andreikin has 2 points. Thursday 20th April is rest day.Another Berlin Ruy Lopez in Viswanathan Anand’s game, this time playing white againstSergey Karjakin. Anand confidently entered the famous endgame, blitzing out the first 20 moves. Karjakin also analysed the line up to 21.Rh1, but his moving was slower as he tried to recollect the exact preparation. He planned to make 23…Nb4 but then he understood that 24.f4 gxf4 25.Bh4+ with next Bf6 would be very unpleasant. Anand tried to prepare f4 but Karjakin placed his pieces on optimal squares and white soon realized that there is no way to make progress. Draw was signed on move 33. Huge tension was felt in the air ahead of the game between Veselin Topalov and Vladimir Kramnik, their first classical since 2008. Somehow they kept missing each other in the past six years, with exception of the quick games in Melodi Amber events. Even the other participants recognized the importance of the moment and kept glancing at the board on far left. The game started as a Queen’s Gambit Declined where Topalov entered the Bf4 variation and then introduced a novel idea with 8.Be5 and 9.Bd3. Kramnik responded by pushing his pawn twice to f4 before starting the logical process of undermining white’s queenside. However, he probably missed the strength of the tactical blow 19.Nxd5, which allowed white to trade down to the practically winning endgame. Topalov duly converted the advantage. Peter Svidler started with the Dutch defence, an opening that he had planned to introduce during this event. Shakhriyar Mamedyarov was not confused, he didn’t take more than two minutes to answer with 2.g3. Mamedyarov criticized his 8.b4, but he had already tried many different moves in this position and it was time for something new. Svidler believed that black emerged with a good position from the opening, having achieved everything that he hoped for. But then, as he said at the press conference, “his brain stopped working for about 20 minutes”, when he made a couple of mistakes in succession. Mamedyarov didn’t take long to elegantly conclude the game. The game between Levon Aronian and Dmitry Andreikin started with Reti opening where the first fight revolved around the black pawn on c4. But then white unbalanced the play by sacrificing two pieces for a rook and a pawn. Black tried to improve on the earlier games of Dutch Grandmaster Smeets, but white was able to trade a couple of pawns and emerge with an outside passer. Cracking under pressure, black was forced to give the material back and transpose into an endgame where white had an extra pawn – exactly that passer on the a-file.